If you’re in Auckland over the summer do remember to drop by the Central Library have a look at the beautiful books on display in the ‘For the love of books’ exhibition. The exhibition runs until the 22nd of February and is located on the 2nd floor of the building in the Sir George Grey Special Collections. Supporting the exhibition is a public event on Friday the 30th of January at 1pm called "The exhibition unfolded." There will be a talk by Sarah Maxey on poetic thinking in graphic design followed by a chance to view and explore artists' books hosted by exhibition curator Georgia Prince. It is in the Whare Wānanga on the 2nd floor of the Central Library building, so do please come along if you are in town. If you can’t make the trip in person do have a look at the complementary online exhibition which gives a fine audio-visual overview of some of the books on display. 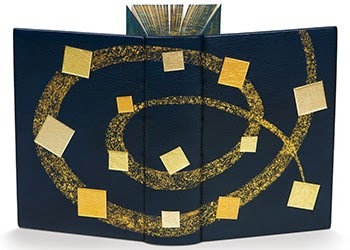 For other events and information relating to book arts or ‘the book’ in the broadest sense of the term do check out the website of The Centre of The Book at Otago University.